Introducing NEW Life Documented: Year.o.graphy! We are thrilled to introduce our NEW Year.o.graphy collection - our newest edition to our uber-popular, best selling Life Documented series! With all new designs, perfectly coordinated colors and fun new additions - our newest year-in-review Simple Stories line is totally fresh, fun and fabulous! Fabulous New Options – 6 all-new Simple Basics cardstock designs to coordinate with our delicious color palette and yummy vintage office prints - plus an all new calendar sticker sheet perfect for creating your own calendar album or project! Fresh New Designs – Super cute new icons, designs and patterns with that aged, distressed hand-made layered look to coordinate perfectly with our original Life Documented collection, but still lend a fresh, stylish look to your year-in-review albums, layouts and projects. Fun New Ideas – All new signature elements, flash cards and sticker designs with a touch of vintage whimsy to help you to celebrate the seasons of your life....each month of the year! Our new Life Documented: Year-o-graphy collection will be shipping to scrapbook retailers the week of October 10...so you should be able to find it on store shelves and websites by the end of October! If you LOVE our Year.o.graphy collection...leave a comment to be entered to win the entire collection! And don't forget to swing on by our Facebook fan page for another chance to win - leave a comment on THIS blog post or our facebook fan page by October 6th, 2011. We'll announce TWO lucky winners on Monday, October 10th! Get ready for something fresh, fun and fabulous...! Simple Basics - Banner Love! Happy Friday! It's that time again - time to chat about the latest trends in the scrapbook industry and show you how to use your Simple Stories Collections to join in on the fun! Banners are hot, hot, hot right now and I am loving incorporating them into all my designs. Simple Stories has made it super easy to create banners in many different ways with their products. Another way that Simple Stories has made creating banners super easy is with their Fundamental Cardstock Stickers. The sheet from the Happy Day Collection has 2 different options for quick & easy banners. I created this birthday card in under 10 minutes with these fun stickers and pop dots! However you choose to create your banners, Simple Stories has the perfect supplies just for you! I can't believe that it is already the middle of September! They say time flies when you are having fun, and that saying couldn't be more true at the Simple Stories office. We had so much fun last week attending Archiver's Srapfest at the Mall of America; sharing our passion for not only our Simple Stories products, but for the scrapbooking industry as well. In between the classes we also had a booth for non stop make and takes. These ladies were die hard scrappers! Kevin was the entertainer in the line, and the ladies loved him. His job was to help the ladies pick out 3 buttons, by the end of the weekend Kevin did not have a voice. We were lucky to get to partner with Therm-o-web! They have some great adhesives! If you are ever adhering glitter, ribbon, sand, or beads to a layout . . . you have to try their Red Super Tape! It was almost as awesome as their Marketing Director, Candace. She was a rockstar at keeping us staffed while Amber and I taught our classes; and she kept us organized!!! Candace made this really cute sign for our end of the line at the end of the day. She is so clever! The lines were crazy . . . do you see why the sign was necessaryry??? We loved meeting our Simple Stories customers! This is a picture of my good friend Molly with some of our customers. Molly designs all of the fantastic classes at Archivers. Thanks for Stopping by Molly! Now comes the other part of this post . . . Planking. I had never heard of planking before last week, but apparently it is a big thing with teenagers. Sue and Jodi (the other Jodi, yep there are 2 of us in the office) decided that they needed to send us some pictures of them "planking" around the office while we were at Scrapfest. I am not sure if we were just extremely tired but as soon as I opened their text message with these pictures I could not stop laughing! I think it is because these are just not pictures that you expect to see from your co-workers at 3 in the afternoon. This is Jodi planking in my office . . . This is Sue planking by, as she said, bridging the gap between their desks. and in our warehouse . . .
Now; not to be out done by the office while were away. . . we made Kevin plank on a garbage can at the Mall of America, yes right in the middle of Scrapfest. There was no way he could say no when 100 ladies were cheering him on. We do have a lot of fun here at Simple Stories and we love our jobs! Thank you for making it possible for us to come in every day and do something we enjoy. You guys rock! We have some very exciting things happening over the next couple of weeks so make sure to keep checking our blog and our facebook page. You won't want to miss it! Sometimes it is the simplest of things that inspires a meaningful project. A few months ago, I was digging through the $1.99 bins at Archivers and found the most adorable chipboard mini album shaped like a onesie. I have since been hoarding it waiting for a project idea. As soon as Simple Stories Baby Steps collection was introduced, I knew it was meant to be. So, I made a little Brag Book about my son. I love the gingham patterns in the Baby Steps collection and thought it was the perfect choice for a onesie. I used the Fundamental Cardstock stickers from the collection to create the title and decorate the onesie. A few pop dots or foam tape make the cardstock stickers come to life with added dimension. I also added some backstitching with floss around the onesies to give them more character and detail. There were four chipboard onesies in this darling mini album from Creative Imaginations. I miss how little and snuggly he was at this age. The expressions are priceless. Such a fun project and so simple to make. Hello Allllll! Wendy here & welcome back to Part 2 of my earlier blog post special technique share with 3 cool techniques. This post is a continuation of some great trendy techniques + still using the fabulous Simple Stories Generations collection. I'll share up 2 more techniques in this post for ya'. So, let's roll with it...oh the FULL supply list was posted up in the Part 1 of 2 but I'll post it up again at the end of this post. 1. Technique #4 - Spritzing & distressing with acrylics, Smooch Spritz, Smooch Paint, and Zutter Corrugated Book Board - Here I used some Zutter Corrugated Cardboard. LOVE this cardboard because it's not your normal "throw in the dumpster cardboard box". It's specially made for the "artista" to peel away the layers and expose all that nice texture and hold paints, textures, and all the mixed media mediums you can put to it. So, here you see I pulled away some layers and went ahead to measure the size needed for my cubby hole in the shadow box. 3. Here I distressed the edges of the board with one of the MUST HAVE tools on the market - Zutter Distrezz-It-All. Forget the sandpaper, this machine (electric powered) is my ultimate go-to for distressing! 4. Love me some rubons! So, added these in along the edge of the board too. 5. I added in some Ranger Distress Stickes and rubbed in the Stickles a bit with my finger. 6. Also, some layers of a vintage brown Smooch Spritz (a great mist with a touch of sparkle). Now the board is ready to put into the shadow box. 7. I layered in lots of embellishments from the vintage finds, pearls in a mini bottle, metal number tab, mini silhouette in frame, buttons, and mini bow (found for 10 cents on clearance aisle at local craft store). The mini thread spools made as shown above using a strip cut from the Generations paper wrapped around the mini spool. Embellishments glued down with glue dots and/or Ranger Glossy Accents. 8. Technique #5 - Distressing with Pearl Ex - The last technique I'll share is using Pearl Ex to distress your favorite embellishments. Pearl Ex is an amazing powder than can be used on glass, metal, etc. Here I used it on the Tim Holtz mini bulbs that were with a clear bulb (dead bulbs, not still active) but I wanted to make them more aged & vintage. So, I rolled the glass bulb along the Ranger Perfect Medium ink pad then brushed with Pearl Ex. Allow to dry (NOTE: You can quick heat set with heat tool but be VERY VERY careful NOT TO OVERHEAT and use tweezers as they will be HOT!) This keeps the Pearl Ex from being so smudgy. I adhered with glue dots in a couple of different cubby holes in the shadow box. 9. I also brushed some Pearl Ex along the edges of the tapes on the shadow box for aging & hint of sparkle. A quick heat set with heal tool. Hope you enjoyed my special technique share! Here's the FULL supply list again for your reference of recommended items! • Shop your stash! Don't let the supply list overwhelm you :) Think of creative adaptations, especially for the trinkets to decorate the inside of your shadow boxes. Try scouting out neat objects at your local thrift/vintage shop(s). Substitution is encouraged! Adapt this supply list to make use of what you already have on hand. •	Support your local scrapbook store! If you need to go shopping, take this printed list with you (after you’ve crossed off or marked everything you already have at home, of course). 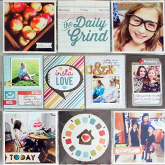 •	If you prefer the convenience of shopping online, check out www.scrapbook.com. Hi all! Wendy here to share up & inspire you with an altered project special technique share using the CHA summer release "Generations" collection! This collection just takes my breath away with the colors, designs, and timeless embellishments. This collection would be perfect for genealogy albums, family theme albums, heritage albums, and family events (i.e. reunions). I couldn't resist thinking on a twist with this collection an altered shadow box. I'm lovin' the 6x6 mini pad which even gives you mini versions of the 12x12 collection. The 6x6 pad is PERFECT for cutting up smaller pieces to tuck away in the cubby holes of the shadow box. Be sure to check out the FULL supply list at end of post. I won't go into ALL the details to make the complete project because this post will be plenty long enough but just to share up some unique techniques to inspire you to create your own version. 1 - The Tim Holtz Configurations box has several options on the back of the packaging for re-arranging the boxes how you choose. As you can see above, I actually took out completely some of the boxes and others I left in. So you move them around as you want in considering your picture sizes, choice & height of embellishments, etc. I planned to use some of the Tim Holtz bottles, so I wanted to make sure the cubby hole used for this had enough height for this. 2 - Grab up the "Generations" collection (6x6 pad) & choose which papers you want to use. Aren't these papers divineeeeeeee?! Go ahead, cut & measure the papers you want to use in which cubby holes & where before gluing down in Step #3. 3. Print up & select your pics to use. I measure some out with a ruler & then trim up to size with my trimmer to fit nicely inside the cubby holes. Mini pics are perfect for these boxes! Also, I had lots of mini pics from previous projects and never throw them away so I re-use pics a lot for different projects. I like to measure & cut all my pics and measure & cut all papers of choice FIRST before glueing & adhering into the cubby hole boxes. I love the Glue & Seal Multi-Medium in MATTE by Ranger (see Supply List at end of post) for adhering the papers on altered projects because it dries clear & yields a strong hold. I glued in all my papers with this adhesive (that you will nto see in the pic above) but you can go ahead & do this step. I reinforce pics & heavier embellishments a bit with glue dots for a bit more of security due to the embellishments that will be layered in later. 5. Technique #1 - Antiqued Photo Fragments In this first technique, I used some Ranger clear fragments, various colors of alcohol inks that would work well for the sepia tone & coordinate with the colors of papers + Ranger Alcohol Blending Solution. 6. Ink up the sponge of a Alcohol Ink Blending Tool with random colors of alcohol ink. I used Raisin, Latte, and Meadow. Don't worry about the colors blending & bleeding into each other on the sponge. 7. Apply to clear fragment (the size I chose will work with the photo that will fit underneath the fragment). So take this into consideration when selecting the fragment size to use. Now, don't worry about the inks drying before you can attach your photo because the next step will show you why. 8. Apply just 1 drop of Alcohol Blending Solution in center of fragment. 11. I attached with glue dots inside this cubby hole of the box. 12. Technique #2 - Foil Embossing - This next technique is really fun & reminds you of vintage tin! Grab up some thin metal sheets. This one I found on a clearance aisle at a local craft store but Ranger also makes metal sheets that are thin enough to glide through your embossing machine. I use the Sizzix Big Shot + a choice of embossing template. 13. "Sandwich" your foil as directed with the diecutting system you use to emboss the foil. Crank through the machine. 14. And HOW COOL IS THIS?!!! You can also jazz it up with some alcohol inks if you like. I chose to keep it plain. 15. Here is how I used it in the cubby hole of the box. Also layered up some printed paper under a fragment, vintage game pieces, rubons applied to a mini Tim Holtz bottle, vintage buttons, and Tim Holtz mini bulbs. I glued all down with glue dots. 16. Technique #3 - Distressing Metal with Paint - I applied white acrylic paint to a metal label holder. Apply the paint generously & making sure to get into the grooves of the holder. along with more close up pics! See you back Monday for more on this project! Good morning! For our Simply Creative posts, we are supposed to use the Simple Stories Elements in a way other than the obvious sliding into your photo sleeves and calling it good. After some serious study and contemplating of the Elements and Flashcards for the 25 Days of Christmas line, I notice something. There are a lot of words on those elements. A lot. Add to that my love of subway art, and I knew what the perfect project for today would be. Using the 6x6 paper pad for the 25 Days of Christmas, I started cutting out all the words I could find. Some of the flashcards were used as is because I loved the graphics, but for the most part, this whole project is just a bunch of text. I started by painting the edge and barely over the front of a small 8x8 canvas with black paint. Then I took my words and began arranging them so they would all fit. This was the hardest part of the project. I strongly urge you to take a photo once you are done, in case you tragically meet up with a random burst of wind (or a 13 year old boy who thinks it's funny to bump you while you're carrying your project to another room in the house--he really didn't do this, just faked it, but it was enough to instill caution!). Next step is glueing down the words. I carefully lifted a few, added a dab of glue, and replaced. Once everything was back in place, I covered the whole surface with a coat of gel medium (you can use mod podge too). This will seal your project. Let that dry, add a bow if you'd like and display for the holidays. You might think it's early for thinking about holiday decor, and you'd be right. However this year, I decided early is my word. I'm one project down, 100 more to go! Have you heard of the The Paper Bakery Kit Club? The Paper Bakery offers a monthly project-based kit each month, anything from a mini album to home decor. Sarah Hill, the owner wants to be that unique club that offers something different-new techniques, new ideas, and new supplies. All kits come with everything you need to create each project included detailed, easy-to-read instructions. Add-on kits are also available for purchase that compliment the main project kit perfectly! Single purchases are available, but the best savings occurs when you have a subscription for The Paper Bakery! Make sure to check out the current kit and the previous ones over at the Paper Bakery Kit club blog. This month she has featured our 100 Days of Summer kit, and we couldn't be happier. With fall coming soon, it is the perfect way to say goodbye to those fun summer months. Now time for a giveaway! Head on over to The Paper Bakery blog and leave a comment telling them what your favorite thing about the September kits are! The Paper Bakery will then pick a winner from the comments and you may win the September project kit GOODBYE SUMMER. You have until 9/17 at midnight CST to post your comments. Hi Everyone! Time to talk trends again with our Simple Basics topic. That means I'm here today to share some ways the awesome Simple Stories lines fit in with all the latest trends. With fall almost officially upon us and summer days waning, most of you are probably all about back to school. But since both my kids are grown and currently (though we all know it's never permanent when they leave, right?) living in other cities, I am not focused on all those cute back to school photos. In fact, as a mom of grown kids, it's sometimes hard to keep taking photos. But I love photography and I love scrapbooking. So, I'm digging all the sites and people lately who provide photo inspiration. I recently came across a 30 day photo challenge list with 30 days worth of prompts. What a great idea for me I thought! Now, as far as mini albums go, this one went together really fast. Why? Well, you know why - because Simple Stories makes EVERYthing easier! I then glued all the pieces onto the cover, added some stickers for the title - and PUNCHED THE HOLES. You want to punch the holes at this point BEFORE you flip to do the inside of the cover. Otherwise, it's harder to figure out where the holes are to be punched. I then wanted a large journaling area for the inside of the cover. I can't say often enough how much I love all the pre-printed designs. All I had to do here was create a 1" strip for the binding edge and then cut a corner of one of the papers to size. Adhere, punch the holes, and then add my journaling prompts.